October brought with it our 6th, and final, event of our FIRST Steamworks season. It was a long and rewarding year with some exhilarating wins (306-305!!) and tough losses (game of inches). In the end, We are proud to have ended our year on a successful note by bringing home an offseason championship banner for the second straight season. 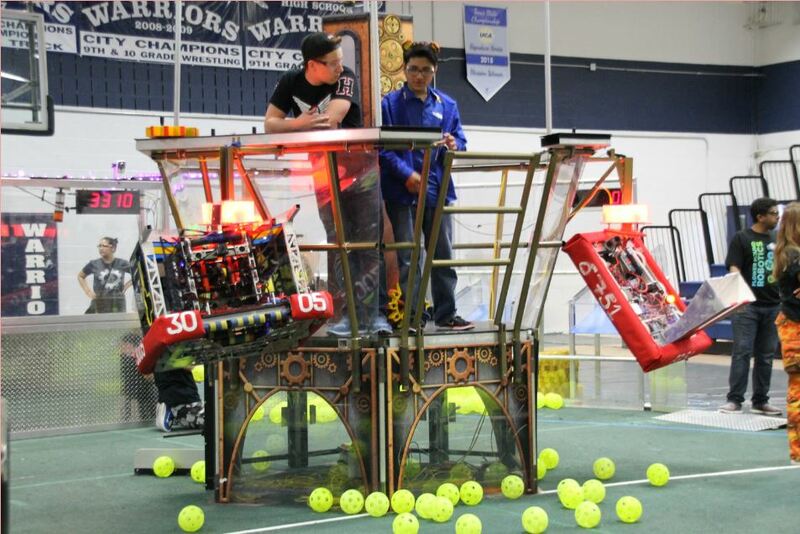 The inaugural NTX Tournament of Robots was hosted at Williams High School in Plano, TX from October 7-8 and, despite it being one of the last offseason events in TX, the competition level was quite high. Our team’s plan for this offseason event was to compete to our fullest, while putting a major emphasis on giving students first-time experience in different or new roles in preparation for next year. While this focus meant our performance through qualification matches was hindered a bit, that sacrifice was well worth the amount of ‘live’ experienced gained by our students in drive-team and pit positions. We were even able to give some new experience former students as our now-graduated drive of the last 3 years exchanged his driver button for a Drive Coach hat (*not an actual hat, but if it was it would look like this). Once the dust settled we found ourselves as the 1st pick of the #1 Alliance Captain FRC3310 – BlackHawk Robotics, and, after fellow DISD team FRC 6751 – RoboFlash was picked, our alliance was all set to go for the gold. The elimination rounds were very hard fought and after prevailing in winner-moves-on rubber matches in both the Quarterfinals and Semifinals we found ourselves in the finals against the alliance of FRC5431, FRC4192, and FRC2765. In the championship round our alliance was able to execute our strategy despite a tough challenge from the opposing alliance and in the end our team’s 2nd offseason banner was won!! 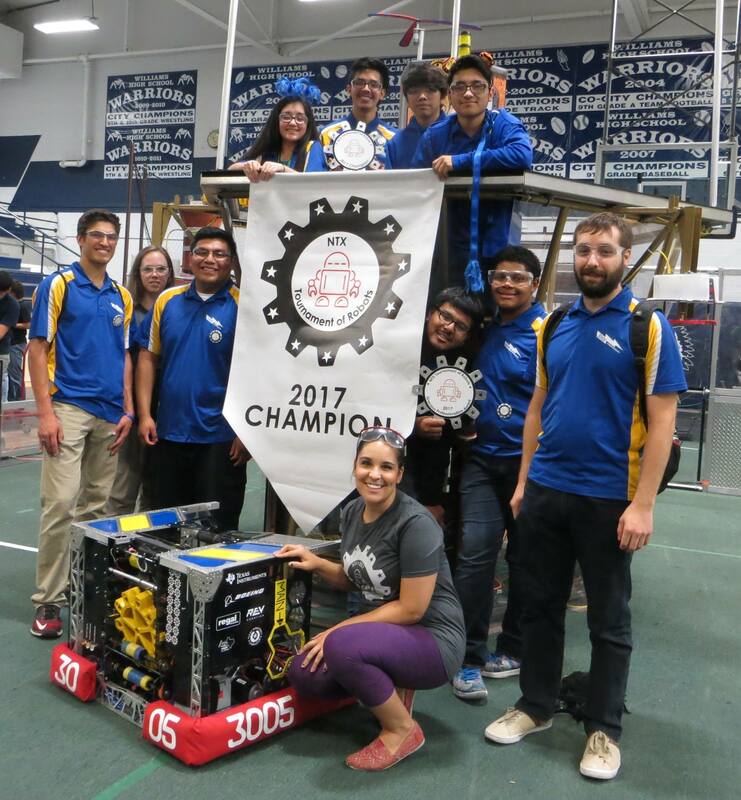 Huge “thank you” to our alliance partners – we were glad to live up to the 1st pick status and to win it alongside a fellow DISD team was definitely a bonus. We also appreciate all of the hard work from co-hosts FRC5431 – Titan Robotics and FRC6171 – Chain Reaction for making the event possible. While winning on the field was great, we were equally excited to have been recognized with the Gracious Professionalism award at the event and it was made even more special to know that it was voted on by our fellow teams at the competition. Our robot, Whirlpool, can now drive into the sunset, take it’s place alongside it’s predecessors, and move onto a leisurely life of the occasional demo event.